This is where we're going to be dancing this season, but keep checking as sessions may change and new venues will be added. If it's raining we'll probably be in the pub rather than outside it! Click on the name for details of the venue. Scroll down to see notes on the dances we will be performing this season. NB Change of venue- the dance at the Lord Nelson Southwold postponed because of football! Danced with ribbon sticks to a jig, with an exuberant 'swing-down' figure near the end. A fine dance with a great tune- look out for the unusual starting position with men and women alternating positions down the set -those on the 'wrong' side are 'improper'. (Come to think of it, so are some of those on the right side....). 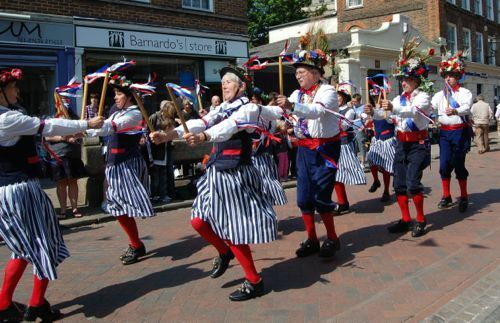 A mix of polka and single step, with a couple of appearances of the Royton step. A bit energetic, this one! Unusual in that it is a circle dance. Written by dance leader Jill in memory of dancer and all-round fine chap John Humphreys. A jolly tune and a jolly dance with a recurring ‘short corners’ figure. New for this year. An energetic step-up with a sort of backwards hop-kick, facing first up then down the set. Look out for the ‘Lancashire Long Step’ near the end. Each figure illustrates places in and around the town of Whitby, such as ‘Flowergate’, ‘Abbey Windows’ and ‘Swing Bridge’. A popular dance notable for the unusual shape of the set which denotes the wings and fuselage of a Spitfire! Danced with traditional wooden bobbins. The step is mostly polka'd. With thanks to John Hakeman of Knockhundred Shuttles who devised the dance. Returning for this year. Taught to us originally by Trefor Owen. Notable for arms aloft and the clashing of sticks. Very aerobic, this one! A rather energetic dance which doesn’t let up much! Ends with a Broadway-style high kicking figure. Sometimes performed as a mass dance when with other morris sides, usually causing some hilarity as the other side invariably dances to a different tune and with the figures in a different order with different names- this only becoming apparent as the dance is in progress. Cue end of session and a dash to the nearest bar. Public dances- "resistance is futile"
Very elegant and easy country dance ending with a snaking figure to get everyone in a big circle. Not at all energetic, suitable for all!